anakpanyu......slowly walking towards the finish line: What I have been doing lately? For the past 4 months from 1st January to 30th April 2012, mostly I have been playing Ultimate or commonly known as frisbee. In January, I played in Miri and in February, I played in Kota Kinabalu. In Brunei, we have league tournament every 1st week of the month starting last February. On top of that, we trained 1 to 2 times per week. Our own custom made Disc. Because of that, I’ve done very little of cycling and NO swimming at all. Its very hard to concentrate with too many sports to do at one time. Tomorrow comes 1st May 2012 and I need to set my priorities straight again. All of the above are mostly running. This year I’m trying to concentrate more on running and less road bike race because I’m not that really good at it and it needs more commitment than running. 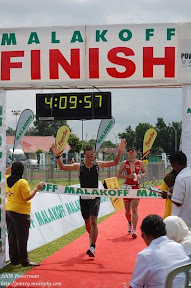 Most of the running leads to the major event which is the 100km trail run. Borneo marathon is part of the preparation. For this race, I’m trying to do sub 5 hours and if possible 4:30 hours. For the HSBC run, I’ve registered for the 11km run and to add more distance to it, I’ll be running from home to the start venue at Taman SOAS which is around 10km, so altogether it will be around 21km. This will be a night run. For the Pusat Ehsan Charity run (THE RUN), I will also be running from home to the start venue at the Waterfront BSB. altogether, it would be around 31km (10km + 21km). I guess I need to start running early around 5:00am so that I wouldn’t miss the flag off. Since Mid July to Mid August will be fasting month, so before that I need to do 80 to 100km per week of running before fasting month and that is a big number. So around May, June and July I will try to do back to back long run and hopefully I can do one or two 50km run. On top of that, I also need to do trail running and repeat hills run. Hopefully my leg can take all of these punishments and no major injury before the event. This is ONE event I’m NOT planning to fail or DNF. 100km trail run in 30 hours given time. So to finish within the time I need to run/walk at a pace of 18min/km. My target would be to do 15min/km to 13min/km pace so that I would have spare time of a few hours, if I do get injured thus forcing me to reduce my pace to snail pace of maybe 20min/km or 25min/km pace. Need to train smart for this………………………. I admire your enthusiasm and dedication towards running n fitness.Great Job! !